We are enjoying a wonderful week+ of spring weather. It is the perfect time to get outside to fire up the grill and enjoy a perfect spring evening. Once the weather turns nice on a consistent basis, we love to spend as much time outdoors as possible and most of our meals definitely come from the grill! 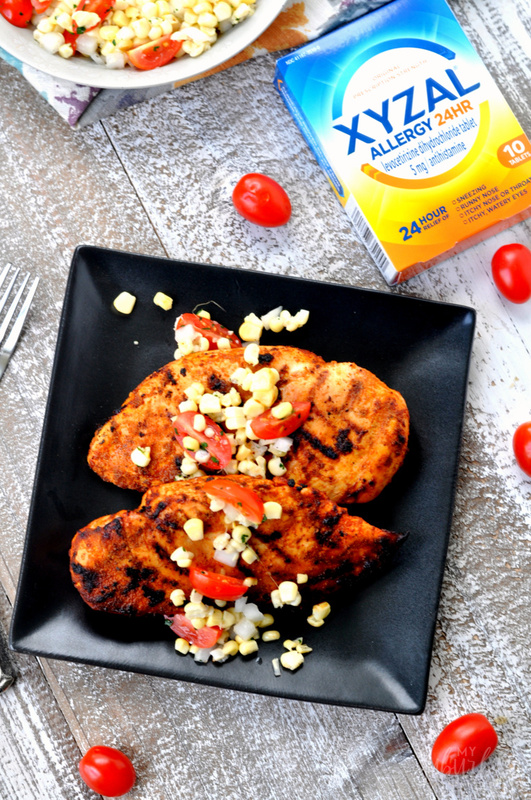 This chipotle chicken is a perfect example! 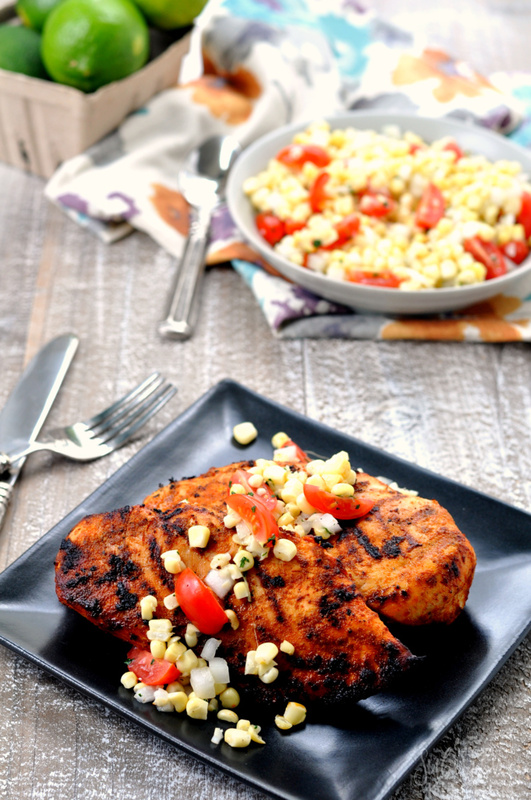 In just about 30 minutes you can have this delicious Grilled Chipotle Lime Chicken with Corn Relish ready to be devoured. Get out there and fire up the grill! This chipotle chicken recipe is going to be amazing, just trust me! This recipe brings a chipotle lime marinade to the table! This is a easy marinade that can be thrown together quickly and will leave your chicken flavorful! While I love to spend time outside grilling up delicious food for my family, this time of year makes it so difficult since I suffer from allergies! From sneezing to watery eyes to an itchy nose, I find it hard to find any relief other than staying inside away from all of the allergens that spring brings along with the gorgeous weather and flowering trees. Recently, I discovered Xyzal® Allergy 24HR at CVS. I picked up the 10 ct package (it also comes in 35, 55 and 80 counts) to give it a try and it provided me the relief I needed to get outside with my family! Xyzal provides 24 hours relief for indoor and outdoor allergy symptoms and works in just 60 minutes. You take it at night and, while not a sleep aid, the relief from allergies symptoms definitely helps provide a better night’s sleep! Remember to always use medication as directed. 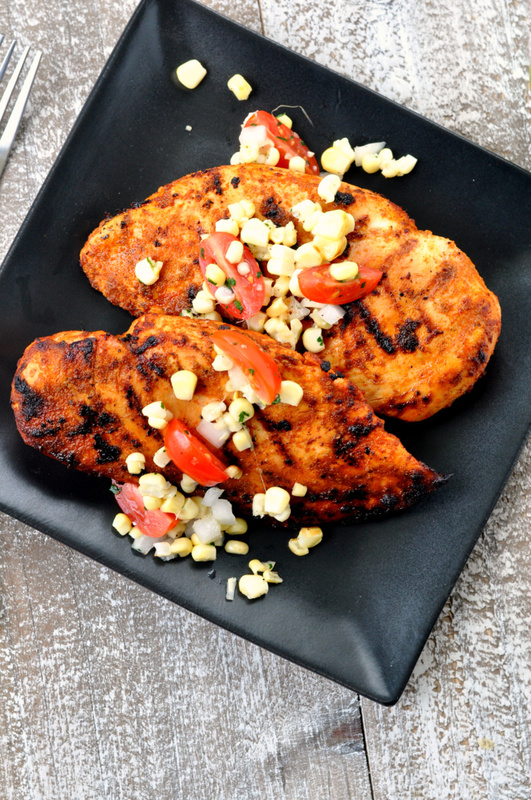 It was just the solution I needed to get back to enjoying spring time and firing up my grill to make this delicious grilled chipotle lime chicken with corn relish. 1. In a large casserole or bowl, whisk together tequila, lime juice, garlic, cumin, smoked paprika, chipotle chili powder and olive oil. Season chicken with salt and pepper. Reserve 3 Tbsp and add chicken breast to remaining marinade. Marinate in the refrigerator for 15 minutes. 2. Heat grill to medium heat. Add chicken breasts. Cook 5 minutes on each side, basting with reserved marinade before flipping. Ensure chicken has reached temperature of 165 degrees. 3. Meanwhile, remove kernels from charred ears of corn. 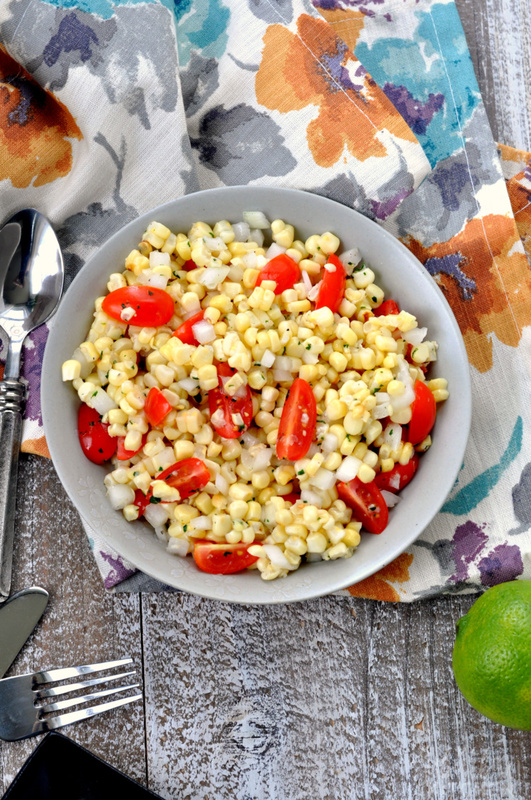 Combine corn kernels, onion, garlic, ginger and lime juice in a medium bowl. Stir in tomatoes and season with salt and pepper. Top with chopped cilantro. Serve over cooked chicken breast. 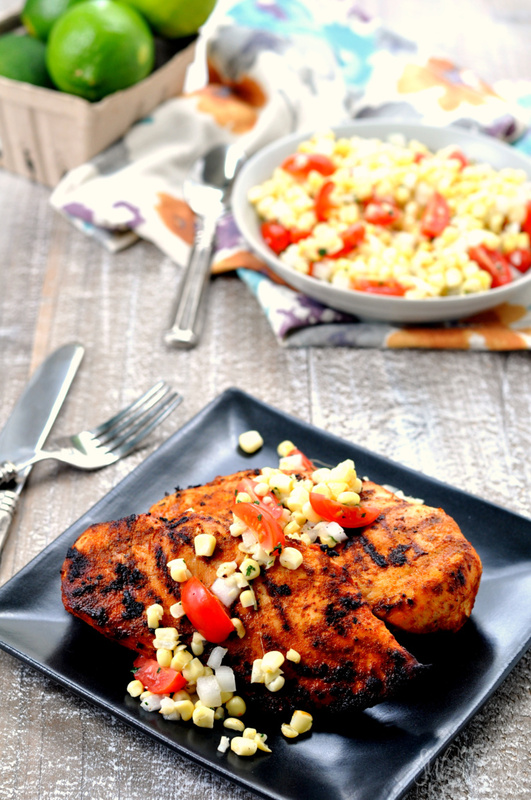 The grilled corn relish is awesome with the grilled chipotle lime chicken but I make it a lot and serve it as a side dish too! So delicious. 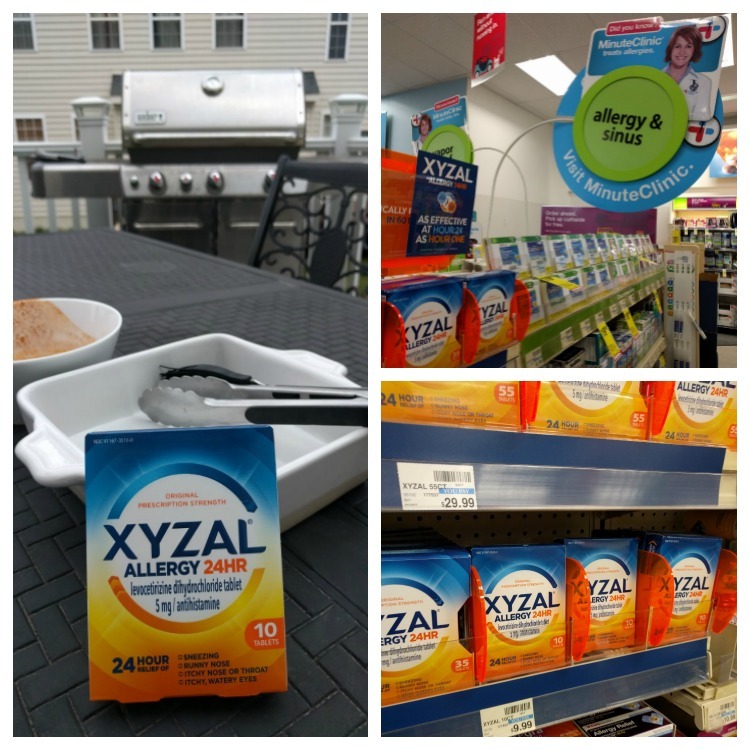 Of course, I make sure I’ve been taking my Xyzal regularly to get the best relief from my allergy symptoms so I can be outside to grill the corn for it! What are your favorite outdoor activities? How do you treat your allergy symptoms to ensure you can enjoy the outdoors? Be sure to look at CVS for Xyzal to get 24 hour relief from your allergy symptoms. You can also visit them on Facebook, Twitter, and Instagram for more information about the brand.